Not many choice for breakfast when you life in handil because just several booth is open, same like in the other place except in Jakarta that have many choice for breakfast. Menu for breakfast in handil that you can buy along roadside is yellow rice, pecel, lontong sayur & sup ceker ayam. Various kind of cake also you can find near football field simpang-3 handil. Yellow rice (nasi kuning) : this food is same like other rice but when cooking added turmeric (kunyit) that make this colour of rice is yellow, yellow rice usually added onion fry, fish (tongkol, kembung, laying fish), beef or braise egg with special flavor. Pecel : pecel is Javanese food, rice with added string bean, sprout, kangkung leaf and of course bean flavor, rempeyek is additional that must be there. Lontong sayur : this food is normally we can see in Jakarta, ‘lontong’ with coconut mink and additional small tempe or vegetable with braise egg. Sup ceker ayam (foot chicken soup) : this sup is introducing by my wife after 3 years life in handil. Like chicken mush (bubur ayam) but the mush composition is only a little, that cause this food is said sup. As per named, this food added chicken foot maybe 5 or 6 pcs. I think this is the best for breakfast at morning, not many hard food for breakfast. 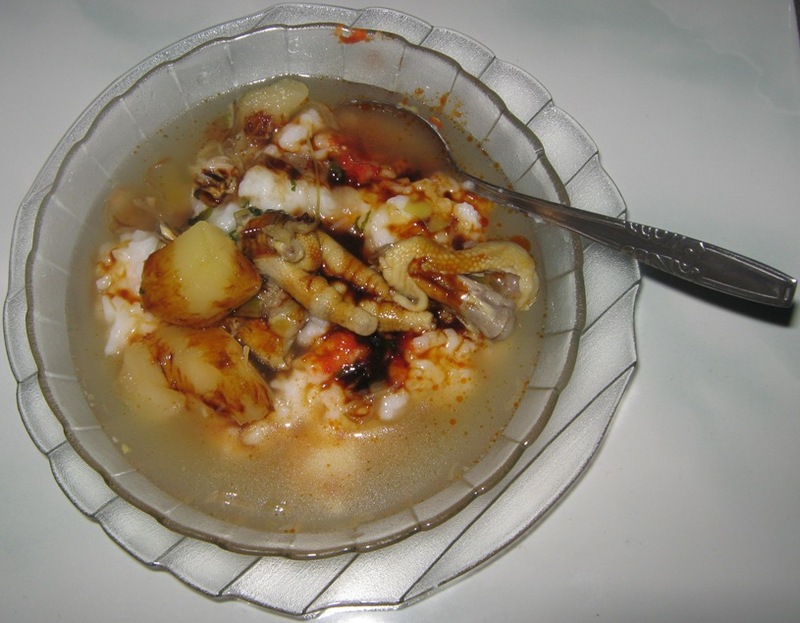 Small cassava & carrot also added in this food that make your breakfast nutritious.